Intertextual Dante is a digital edition of Dante’s Commedia that highlights its intertextual passages – in this first version, the Ovidian intertextual passages in the Inferno, with Purgatorio and Paradiso in preparation. The project offers a new way to read and research intertextual passages in the Commedia: it transforms the print concordance, a static list of corresponding passages, into an interactive digital tool that allows users to read the intertextual passages side by side and in context. This project originates in my research on Dante and Ovid, as first conceptualized in my dissertation (Columbia, 2013). I then worked with Columbia University Libraries to develop Intertextual Dante. The reading tool, which aligns passages from Dante’s Commedia with his source texts, was coded and designed by Jack Donovan of the Digital Library and Scholarly Technologies Division. exploring where and how often Dante features Ovidian allusions in his word choice, characters, places, or events, and in similes. Our aim is to continue adding more authors and texts to Intertextual Dante. Akash Kumar is currently editing the Dante-Guinizzelli edition for Intertextual Dante and I look forward to welcoming contributions from other colleagues. The ultimate aim is to create digital editions of the Commedia and Dante’s other works that highlight all of their classical, biblical, and vernacular sources. But it is fitting that this project should start with Dante and Ovid. For both poets “novelty” is a key concept and they are both deeply invested in changing elements from the tradition into something new – this is one of the reasons Dante was so drawn to Ovid. The Intertextual Dante project, rooted in the long tradition of studying intertextual passages in the Commedia, sets out to transform this study with the same kind of innovation that Dante and Ovid brought to their work. 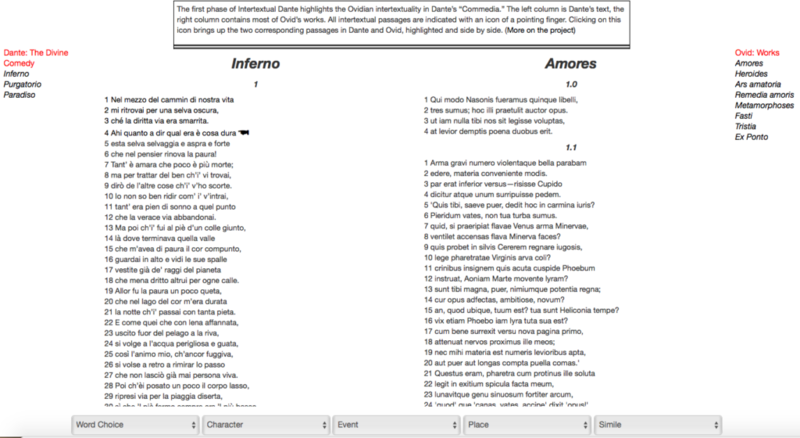 Once you enter the digital edition, the left column features the text of Dante’s Commedia while the right column contains his source texts: in the Dante-Ovid edition, this includes all the works by Ovid that Dante used in the Commedia. You can scroll up and down in both Dante’s and Ovid’s texts. To go to a specific canto in the Commedia or a specific poem or book within Ovid’s works, use the tables of contents on the far left and far right sides of the page. All intertextual passages are indicated with the icon of a pointing finger. Clicking on this icon brings up the two corresponding passages in Dante and Ovid, highlighted and side-by-side. On top of the page, a brief comment appears that explains the connection between the two passages, written by the editor. The tables of contents at the far left and far right situate the passages within the correct canto (Dante) or poem or book (Ovid). The drop-down menus at the bottom of the page allow readers to look for specific categories of intertextuality: for Ovid, these are word choice; characters, events, and places; and similes. More detailed instructions can be found here. The Latin poet Ovid (43 BCE-17CE) wrote love poetry and fictitious love letters (the Amores and the Heroides), treatises on love (the Ars amatoria and the Remedia amoris), the Metamorphoses (15 books with over 100 stories on change from the beginning of the world to Ovid’s time), the Fasti (an incomplete poem on Roman festivals and traditions), and two collections of letters written during his exile in Tomis near the Black Sea (Tristia, Epistulae ex Ponto). Passages from all of Ovid’s writings are found in the Commedia. Intertextual Dante currently features all Ovidian intertextual passages in Dante’s Inferno, with Purgatorio and Paradiso in preparation. Dante was an attentive reader of Ovid: the repeated instances where several details from a larger passage in Ovid’s writings make their way into the text of the Commedia strongly suggest that Dante was working closely with Ovid’s Latin text, and not simply with isolated phrases from Ovid’s writings collected in medieval anthologies. At other times, Dante selects a seemingly uninteresting phrase or sentence from an Ovidian passage whose themes relate to those of the episode in the Commedia. The different ways in which Dante uses his Ovidian sources can be studied more easily on Intertextual Dante, where the two texts are presented side by side in their entirety. The reader now can find the full episode in the Commedia and explore the broader context of the Ovidian passages that inspired Dante, not just the two corresponding verses that a print concordance provides. The distribution of Ovidian material in the Commedia becomes strikingly visible on Intertextual Dante: the icons, the visual markers of intertextual passages in the text, readily accentuate which are the “Ovidian” cantos in the Commedia and which passages in Ovid’s writings Dante was drawn to the most. The instances where Dante translates or paraphrases Ovid’s language are many and varied, and for that reason I further divided them into categories that are more attentive to Dante’s specific use of his Ovidian sources: word choice, characters/places/events, and similes. These categories, which can be searched separately on Intertextual Dante, provide more information about specific stylistic, structural, and rhetorical aspects of Dante’s textual appropriation. The multiple interactive ways in which the entries on Intertextual Dante can be read and researched open up new avenues to the study of Dante’s Ovid. In this essay, I describe in more detail the specific features of the Dante-Ovid edition, as well as the place of a digital project such as Intertextual Dante in the history of studying Dante’s sources.